C’erano una volta un gabbiano che amava una balena, e una balena che amava un gabbiano. Once upon a time there was a seagull who loved a whale, and a whale who loved a seagull. Il gabbiano amava il bellissimo sorriso della balena. Amava il modo elegante in cui lei nuotava nel mare. The seagull loved the whale's beautiful smile. He loved the graceful way she swam through the ocean. La balena amava le piume bianche e graziose del gabbiano. Amava guardarlo mentre planava nel cielo. 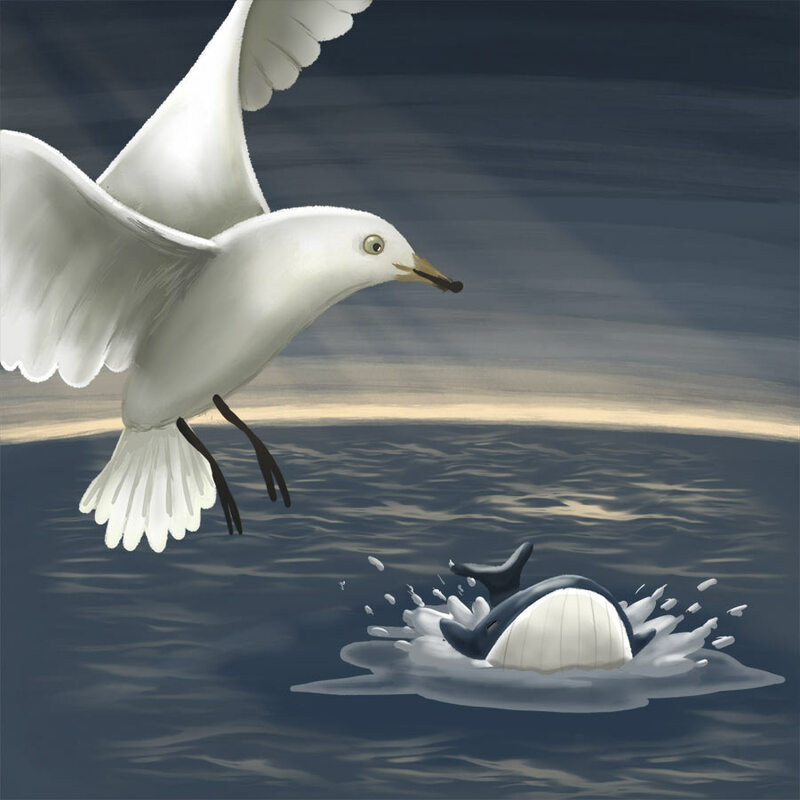 The whale loved the seagull's charming white feathers. She loved to watch him soar through the sky. Ed entrambi amavano mangiare tantissimi pesciolini. They both loved to eat lots of tiny fish. In estate, il gabbiano e la balena si incontravano nella baia. Parlavano moltissimo: parlavano della luna, delle maree e delle navi sull’oceano. In summer, the seagull and the whale met in the bay. They talked a lot. They talked about the moon, and the tides, and the ships on the ocean. Il gabbiano raccontava barzellette e la balena rideva. La balena cantava canzoni tristi e il gabbiano piangeva. The seagull told jokes and the whale laughed. 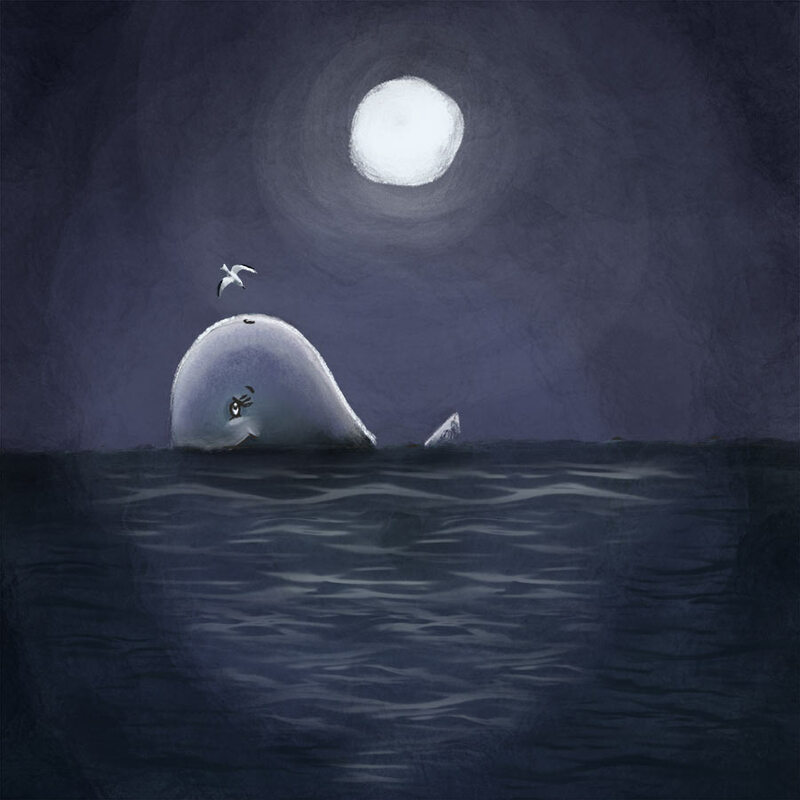 The whale sang sad songs and the seagull cried. “Un giorno potrai venire nell’oceano a conoscere la mia famiglia,” disse la balena. “E tu potrai conoscere i miei amici sulla terraferma,” disse il gabbiano. "One day, you can come to meet my family in the ocean," said the whale. ‍"And you can meet my friends on the land," said the seagull. Ma il mondo non smette di girare solo perché un gabbiano e una balena si innamorano. L’estate diventò autunno, e l’autunno diventò inverno. L’oceano divenne freddo, e tutte le balene andarono in cerca di acque più calde. But the world does not stop turning just because a seagull and whale fall in love. Summer became autumn, and autumn became winter. The ocean became cold, and all the whales left in search of warmer waters. "Come with me to (where there are) warmer waters," said the whale. "It’s a wonderful place. It's always warm, and there are so many fish to eat." "I love to eat fish," said the seagull. "And I love you. I will follow you anywhere. But first, teach me to be a whale." “Così!” disse la balena. “Seguimi!”, e si immerse nell’acqua. “Va bene!” disse il gabbiano immergendosi nell’acqua. "Like this!" said the whale, "follow me! ", and she dived deep into the water. "OK!" said the seagull, and he also dived into the water. Ma presto non riuscì più a respirare, e respirando a fatica ritornò in superficie. Provò a nuotare, ancora e ancora, ma ogni volta restava senza fiato. But soon he could not breathe. He returned to the surface, gasping. He tried to swim, again and again, but he ran out of breath every time. "I don't think a seagull can become a whale," said the seagull. "Come with me instead. I live up on the cliffs. It is a wonderful place. It's warm and cosy, and every morning you can watch the sun rise." 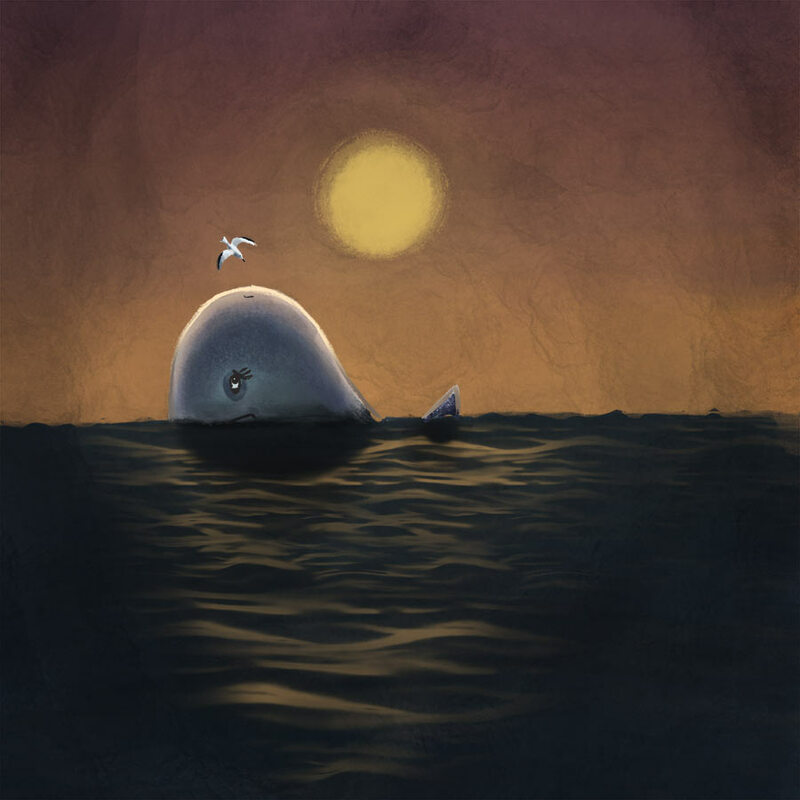 "I love to watch the sun rise," said the whale. "And I love you. I will follow you anywhere. But first, teach me to be a seagull." “Così!” disse il gabbiano. “Seguimi!” E sbattendo le ali cominciò a volare nel cielo. "Like this!" said the seagull. "Follow me! ", and he flapped his wings and soared into the sky. "OK!" said the whale. She squeezed her eyes shut and flapped her fins, just like the seagull. She flapped more and more, up and down. Water splashed everywhere. "I'm flying!" she laughed. "I'm a seagull!" Ma quando aprì gli occhi, si accorse che non stava volando. Era ancora nell’acqua. Provò a volare, ancora e ancora, ma non ci riuscì. But when she opened her eyes, she was not soaring in the sky. She was still in the water. She tried to fly, again and again, but she just couldn't. “Non penso che una balena possa diventare un gabbiano,” disse la balena. ‍“Tu non sai volare, io non so nuotare. Dove possiamo andare a vivere insieme?” chiese il gabbiano. “Resteremo qui – tra le onde!” disse la balena. "I don't think a whale can become a seagull," said the whale. ‍"You can't fly, and I can't swim. So where can we go to live together?" said the seagull. ‍"We will stay here — in the waves!" said the whale. Ma il gabbiano scosse la testa con tristezza. But the seagull shook his head sadly. "You love to swim deep in the ocean," he said. "That is your favourite thing to do. You will never be happy here." E quindi, siccome il gabbiano e la balena si amavano tantissimo, si dissero addio. And so, because the seagull and whale loved each other so much, they said goodbye. Ma mai si dimenticarono l’uno dell’altro. Ogni volta che la balena vedeva un gabbiano che volava alto nel cielo, ripensava al suo gabbiano. Sperava che anche lui fosse così: felice nel cielo. But they never forgot each other. Every time the whale saw a seagull flying high in the sky, she thought of her seagull. She hoped he was like that: happy in the sky. E ogni volta che il gabbiano vedeva una balena che si tuffava nell’oceano, ripensava alla sua balena. E sperava che anche lei fosse così: felice nell’oceano. And every time the seagull saw a whale diving deep in the ocean, he thought of his whale. He hoped she was like that: happy in the ocean. 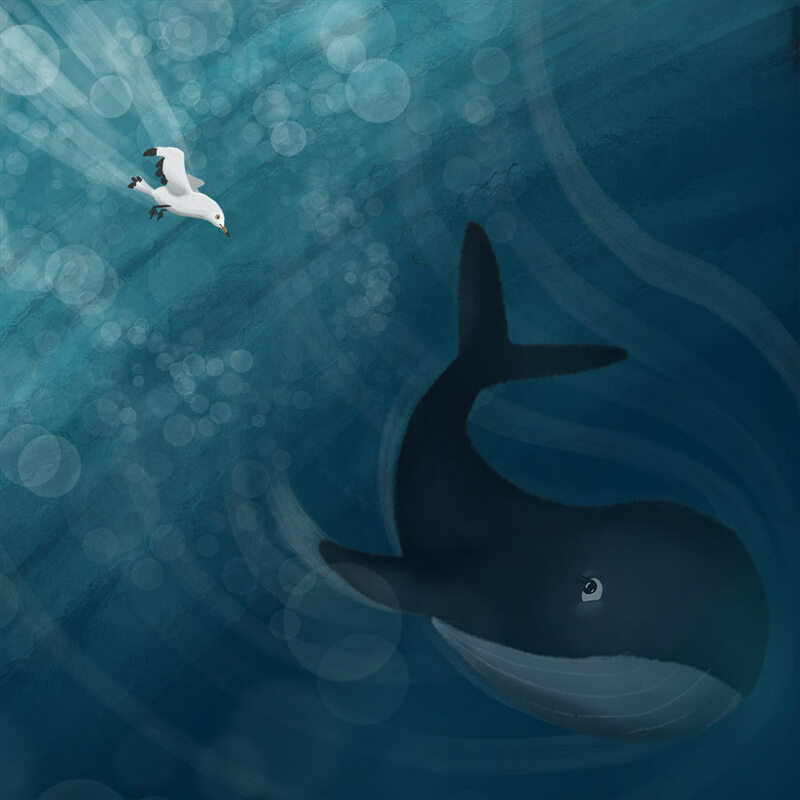 Based on "The Bird and The Whale", by Aletta. English version here (voiced awkwardly by the author). Also available in French and Spanish (voiced by professionals). How to say early, late, sometimes, never and other time concepts in Italian. How to use all those little words that say whether it's his cookie, her cookie, their cookie, or your cookie.